Marathon (n.): a long distance running race, strictly one of 26 miles and 385 yards (42.195 km). Listen to your body! Keeping a balance between life and work can get exhausting some weeks. While going on a run when you’re stressed and tired may sound like a good idea, on occasion, it may be better to either cut back some mileage or just take a rest day. Yes, to a runner, that is devastating news. We have learned to move on and make our next runs better. whatever works to curb mid-run hunger. Weight gain. Both of us had a mini life crisis when we realized that around the first round of our 20 milers, we had packed on a few pounds. It. Will. Happen. We were reminded by our coach that it will be ok! And it was. The extra weight went away right at the start of taper. Accountability. 16 weeks of marathon training does take a chunk of time. Finding accountability buddies keeps us motivated and gives you an ongoing cheerleader. Shoes. Running shoes do get expensive. But then again, so does a medical bill for a knee injury. We both listened to our bodies when our shoes became worn out. We know that we should get a new pair on average every 6 months or so, depending on your mileage. We always think we can outwear our shoes a little longer. A new pair definitely makes long distances bearable and pain free! Running buddies. Find a running buddy for those long weekend runs. We learned this one much later in the training. But better late than never! When running a long distance anywhere from 13mi+, it can get boring regardless of scenery. Having a running buddy to chat with definitely makes the miles go by faster. 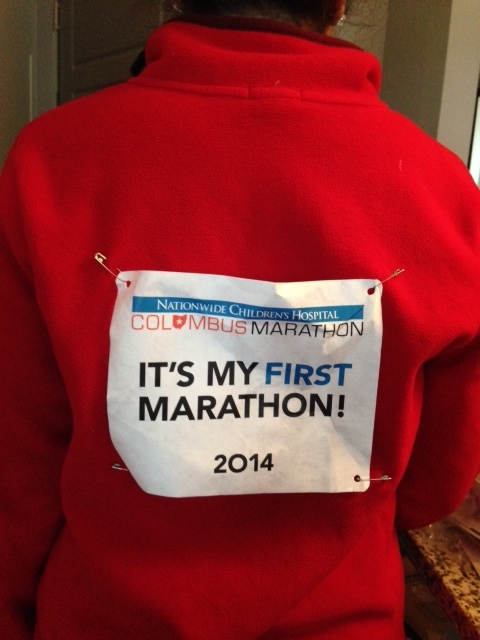 Perhaps find a local running group… maybe Living Fit Columbus! Yoga. Long miles of pounding the pavement do a number on a runner’s body. Often, we forget to stretch after runs, which results in knots. We found yoga to be our solution to not only stretch, but also get some cross-training workouts into our repertoire. Have fun!!! That feeling of accomplishment after every run has taught us why we began training in the first place… To have fun and enjoy ourselves. Running is one of our favorite hobbies. This was Lan’s second marathon and a new PR! 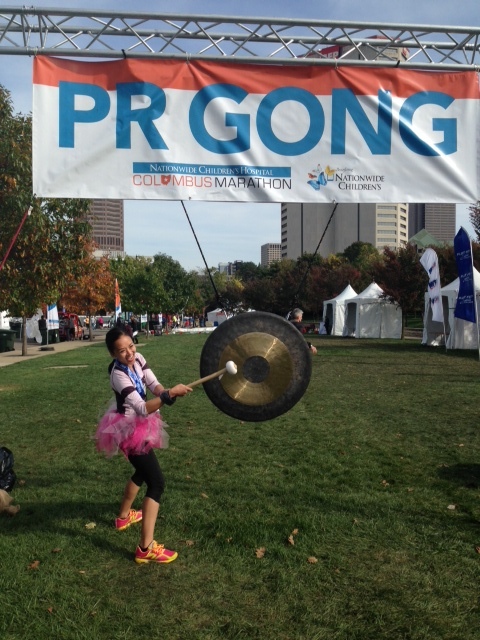 Here she is, a proud finisher, ringing the PR gong. There’s something amazing about seeing and living the world through a fresh pair of eyes. Whether it’s a baby mesmerized by the new sounds and colors that come with the rustling of the fall leaves, experiencing excitement and success as you reach your destination without backtracking in New York City, or having a friend witness their first Buckeye game with the infamous dotting of the “I”… Our first experiences always leave a special mark and become our reference point for the future. We sometimes take for granted those “ah-ha” moments and the astonishment that comes with accomplishing a goal as things slowly turn into habit. It was not too long ago I never thought I could run again let alone a marathon, and I hope I never lose that sense of “so this is what it feels like.” But the process of getting there was something I reflected on throughout the race. Everyone asked why a marathon, why this race. I definitely had my own personal reasons for starting the marathon. But by the end of the race, I found it to be for something even greater than myself. At one point…I think mile 18, I started thinking…”I really should’ve turned left and finished this race 5 miles ago.” But then somehow I would keep going because at each mile of Nationwide Children’s Hospital Columbus Marathon, there would be a picture that was dedicated to another child that was battling the fight against various illnesses. The miracle mile was an emotional stretch being reminded of those that lost their lives to the fight. But seeing the families and how they honored each child, supported each of us runners and stood out in the cold for hours to remind us…it was a humbling experience to say the least. I started the race thinking, “Oh I wish maybe there was a sign someone I knew would be holding for me”, but found an ARMY of supporters cheering all of us to the finish. I realized this race was about something even greater…I got to run through the most beautiful parts of this city seeing humanity at its finest as the volunteers would help refuel us, the police kept us out of harms way, the Red Cross was there to get us back up and the masses out to leave us candy and motivational posters to read along the way. The camaraderie amongst the runners was truly something to be witnessed. Even leading up to the training, yoga instructors and running enthusiasts were incredibly supportive and willing to help any way they could. It was an event that brought the community and it’s people together to make a positive impact on this world when despite so many times we hear the opposite. This was one small goal I wanted to accomplish, but with all those that ran, it was a heroic effort to help this world and its people. It’s a beautiful thing to see strangers come together and wanting everyone to reach their goals and support an effort outside their own. . I really learned during this race what it means to live for something greater than myself. And I hope I never forget this feeling. Mahvish out on the course – working towards finishing her first marathon! Mahvish and Lan are truly an inspiration to not only our fitness/running/yogi-ing group, but to all humans everywhere. They are two of the most positive, ambitious, motivated women we know, yet remain humble and kind during the process. 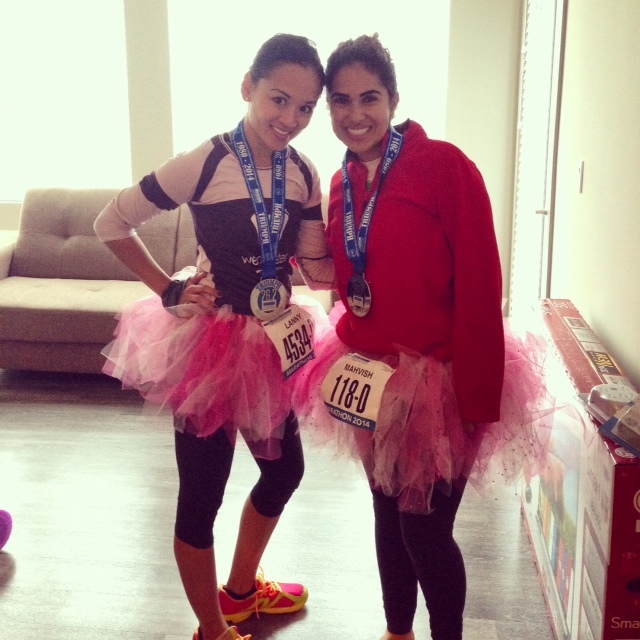 We are very proud of their marathon finish and can’t wait to hear more about their FIT adventures in 2015!